Connect your Lightning-equipped iPhone, iPad, or iPod to your USB Type-C or Thunderbolt 3 equipped MacBook, MacBook Pro, iMac, or iMac Pro for syncing and charging with the 3.3' USB Type-C Male to Lightning Male Cable from Apple. It can also be used with Apple's 29W, 61W, and 87W USB Type-C Power Adapter to charge your iOS device. Users of the iPad Pro and iPhone 8, 8 Plus, and X will also be able to use the USB Type-C Power Adapter to take advantage of their device's fast-charging feature. Box Dimensions (LxWxH) 3.2 x 2.6 x 0.8"
USB Type-C to Lightning Cable (3.3') is rated 5.0 out of 5 by 2. Rated 5 out of 5 by Jean from Good connector! Connects Macbook to iPhone. Would this work for iPhone/iPad with DJI Mavic Air RC Interface? 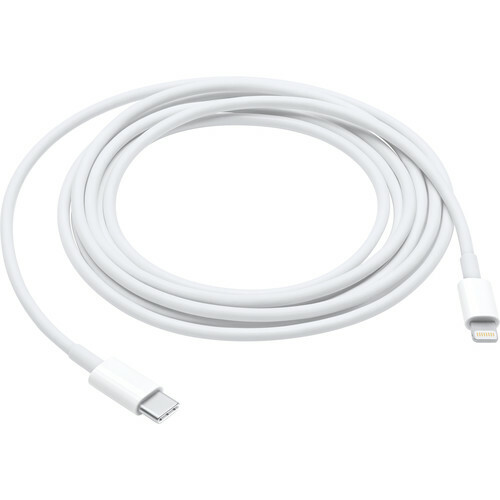 Is this a genuine usb-c to lightning cable? Yes, this is an official Apple USB Type-C to Lightning Cable . The Lightning side of the cable is the limiting factor so having USB 3.1 (USB 3.0 type 1) wouldn't provide any benefit even if it was. This cable would work for iPhone/iPod touch with Windows 10 PC Interface? Im using it for a new MacBook Pro to iPhone X. But I imagine it would work for anything with a USB C to lightning connection. Does this cable support Quick Charging of the 2017 iPad Pro 12.9 under IOS 12? Would this allow for direct wired transfer of images from Nikon Z6 to an iOS device/Does iOS recognize a connected Nikon Z6 as a camera with import options?